Oral hygiene and dental health start with a toothbrush. We all have a toothbrush from the start of our lives, and as soon as our teeth start growing in, brushing them becomes an integral piece of our daily routines. Whether you have used the same type of toothbrush for years or have tried out different styles, bristle densities, or ventured into the electric toothbrush area, you have been brushing for years and most likely don’t have plans to stop. It can be just as difficult to teach your children to brush their teeth and ensure they continue to do it when you aren’t looking. Actually brushing is important, but brushing the right way is even more crucial for your young children’s dental health. Today, the Alligator Dental team wants to give you some tips to ensure your kids are brushing properly and keeping their pearly whites healthy from a young age. If you think your youngster is due for a checkup, give us a call to set up an appointment today! Remember those small hourglasses you used to keep by your sink as a young kid? If your parents had you use those to time how long you spent brushing your teeth, you are not alone. While making sure you brushed for the full duration of falling sand may not be entirely necessary, it is important that your kids know they can’t get a quality tooth brushing in 30 seconds. To ensure dental whitening and preservation of healthy teeth, a time of around one minute and forty-five seconds to two minutes is optimal. This is where the hourglass method comes into hand, but something like a phone timer or stopwatch could work as well. Your children won’t need to brush under time constraints forever, but using it early on can help them understand the length of time necessary to get a good, thorough tooth brushing. We’ve all heard it before: when brushing your teeth, use a circular motion to ensure the most effective teeth cleaning. While it is important to use the right technique, you won’t have to teach your children to make circles across their teeth as they brush. Instead, when the brush approaches the teeth, make sure your kids place it at a 45-degree angle in relation to their gums. This will give anyone brushing an angle at which they can produce enough pressure to get a deep enough clean. The circular idea comes from the most effective way to use the brush across your chompers. Especially when it comes to the front of teeth, short strokes are the key to ensuring effective teeth cleaning. Don’t take long strokes, as the bristles will not be able effectively clean and clear any debris from the surface of the teeth. Shorter movements also allow a brusher to reach the junk that might be sitting in the gaps between teeth, which will make flossing an easier venture as well. It’s easy to focus on the visible parts of your teeth. Maybe you or your youngsters think the biting surface of your pearly whites is the most crucial part to brush since they get the most action. However, the backs of the teeth are just as important when it comes to brushing and oral hygiene. Neglecting the backs of the teeth can lead to buildup of plaque, food debris, and other things that can lead to cavities, gum disease, or other dental ailments that negatively contribute to oral hygiene. When teaching your children how to brush, make sure they are brushing the backs of their teeth to get an all-around clean. 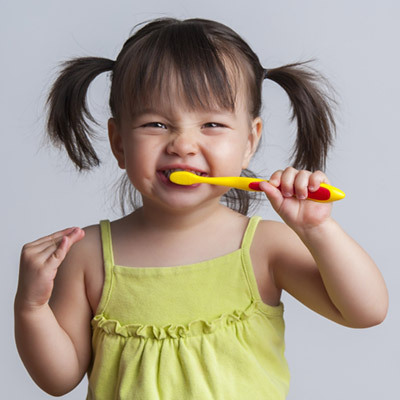 Brushing teeth is a fundamental piece in oral hygiene, especially for your kids. 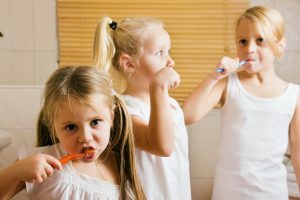 If they need some more help to become toothbrush masters, are due for a checkup, or are experiencing a toothache and may have a cavity, call Alligator Dental today. We are one of the top choices in San Marcos for pediatric dentistry, and we aim to make sure your children enjoy their time at their local dentist office. Rather than dreading the dentist, we’ll make sure your kids can’t wait to come back. Get in touch and set up your child’s next appointment today; we look forward to seeing you!